Britain's team sprint squad started their Olympic year with victory at the Track Cycling World Cup in Hong Kong. 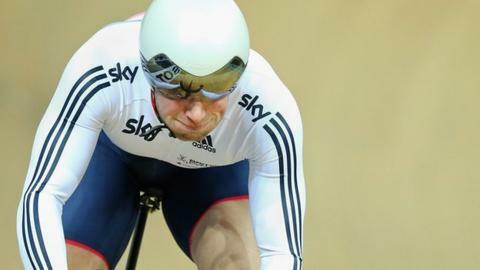 Jason Kenny, Philip Hindes and Callum Skinner beat Poland by 0.051 seconds. Britain's women's team pursuit and team sprint squads both took silver, beaten by Canada and Russia respectively, and the men's team pursuit won bronze. Mark Cavendish is fourth halfway through the omnium after second places in the scratch and elimination races and a 16th in the individual pursuit. The Manxman, who is yet to win an Olympic cycling medal, is aiming to qualify for the track cycling team at the Rio Games in August but faces stiff competition from Ed Clancy and Jon Dibben for the omnium place. Olympic champion Laura Trott leads the women's omnium at the halfway stage, from USA's Sarah Hammer and Belarus' Tatsiana Sharakova.